Although we don’t keep an official blogroll (Maybe we should?) 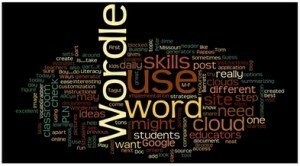 here at Networked Teaching & Learning, we read a lot of blogs, mining them for resources and ideas. I try to give credit where credit is due, but sometimes useful blogs slip through the cracks. The following blogs may not always lead directly to posts here, they do offer plenty of inspiration and influence what I do on a daily basis. Venspired was previously known as Teacher Factory but still features the same great collection of blog posts. Written by gifted teacher and sometimes NT&L contributor Krissy Venosdale, Venspired covers a wide array of topics, mostly focusing on creativity and student-centered learning. Get inspired and add Venspired to your blogroll now. There are good things coming from over seas in educational technology. Two blogs to check our are Australia’s EdTech Toolbox and England’s EDTE.CH. EdTech Toolbox features a new online tool 2-3 times every week. That’s more than I can handle sometimes. Although EDTE.CH‘s Tom Barrett has been suspiciously absent from posting as of late, his insights, recommendations, and tips are among the best in the field. Also, this is where he keeps his “Interesting Ways” collection. Dan Meyer is a math teacher that would have fit right in at eMINTS. His blog is dy/dan and within this blog, Dan demonstrates how creativity and putting learning first materialize in the mathematics classroom. Although he’s now working on a doctorate at Stanford, Dan is always looking for ways to make Math real and tangible for students. Those are five blogs that provide a lot of inspiration around these parts. What blogs do you look to for inspiration and insight? How can reading blogs and participating in their conversations help us as educators?